The 2018 edition of the Don’t Drink and Drive campaign aimed at creating safety awareness on Nigerian roads in order to minimise the dangers of drink-driving has commenced. The initiative is organised by Nigerian Breweries Plc with support from the Federal Road Safety Corps (FRSC). 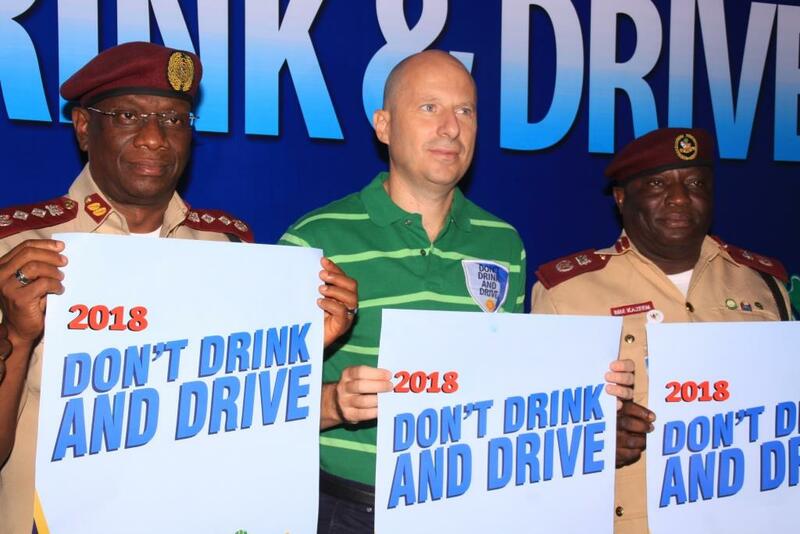 Last Tuesday, the 2018 Don’t Drink and Drive campaign, the 11th in the series, was formally flagged off at press conference held at Nigerian Breweries, Iganmu, Lagos. Speaking at the event, Managing Director and Chief Executive Officer of Nigerian Breweries Plc, Mr Jordi Borrut Bel, said the Don’t Drink and Drive campaign is a Corporate Social Responsibility (CSR) initiative designed to improve safety on Nigerian roads by discouraging the habit of drink driving especially among commercial drivers, motorcycle riders and private car owners. Mr Borrut Bel explained that since the start of the initiative, the company has held enlightenment rallies in motor parks and other locations in 42 cities and towns across the country. “In the process, we have directly engaged over 20,000 drivers, other road users and a higher number of people through media messages,” he stated. In his remark, Corps Marshall and Chief Executive of FRSC, Mr Boboye Oyeyemi, commended Nigerian Breweries for the laudable campaign which he said is worth emulating by other organisations. He said the campaign’s impact on road users, especially commercial drivers, has been high, since the Corps signed a memorandum of understanding with the leading brewing company. He affirmed that in order to promote responsible drinking, the FRSC has acquired digital alcoylser to test the level of alcohol in drivers. “If the alcoholic content exceeds 0.05mm in a driver, then it is considered abnormal and not good for driving,” Mr Oyeyemi said.